The Krone Galileo writing instrument honors the achievements of Galileo, a mathematician, astronomer and inventor. The hand painted midnight navy cap radiates color from cosmic orange to celestial gold. Atop the cap lies a sterling silver three-dimensional portrait of Galileo gazing towards the heavens. 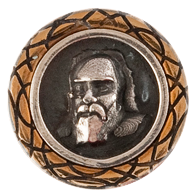 The clip modeled after parts of his telescope, directs the eye towards ‘Galileo’, which is emblazoned into the band at the bottom of the cap. A unique, hand painted, mother of pearl barrel marries images of celestial constellations along with an artistic interpretation of their symbolism. The dark night sky provides exceptional contrast for these luminescent figures. Available in a worldwide Limited Edition of 18 fountain pens. The hand painted midnight navy cap radiates color from cosmic orange to celestial gold. Atop the cap lies a sterling silver three-dimensional portrait of Galileo gazing towards the heavens. The clip modeled after parts of his telescope, directs the eye towards ‘Galileo’, which is emblazoned into the band at the bottom of the cap. A unique, hand painted, mother of pearl barrel marries images of celestial constellations along with an artistic interpretation of their symbolism.The dark night sky provides exceptional contrast for these luminescent figures. Available in a worldwide Limited Edition of 18 magnum fountain pens.